Bajaj Pulsar 180F has been spotted at a dealership, hinting at the unofficial commencement of bookings and test rides. The booking amount has been set at Rs 1000 and the motorcycle is priced Rs 86,500 according to dealers we spoke to. Essentially, Bajaj has added the Pulsar 220F’s half fairing on the 180, including the dual projector headlamps. Other than the new bodywork and colour schemes, the motorcycle is mechanically the same as the regular Pulsar 180. There are no changes in the output figures either, as the bike retains the 178.6cc single-cylinder air-cooled engine which churns out 17.02PS of power and 14.22Nm of torque. Suspension bits include telescopic front forks and twin gas-charged shock absorbers at the rear. Braking is handled by 260mm front and a 230mm rear disc. The Bajaj Pulsar 180F competes with the TVS Apache RTR 180 in its segment. Bajaj Pulsar 180F prices start at Rs. 94,278 (Ex-Showroom). Bajaj Pulsar 180F is available in 1 variants . Share your experiences with Pulsar 180F? Q. Which is better RTR 1604v or Pulsar 180F? Q. Which bike is better Yamaha MT-15 or Pulsar 180F? Q. Can I install ABS in new Pulsar 180F? The Single channel ABS comes standard in the Bajaj 180F. As per the government rules, ABS is mandatory to be provided by the manufacturer in the bikes above 125cc. Q. It is suitable for short height boy my height is 5.5 ft? Awesome bike. Got it since I didn't had budget for pulsar 220f. Not much difference between 220 and 180. Just buy it. 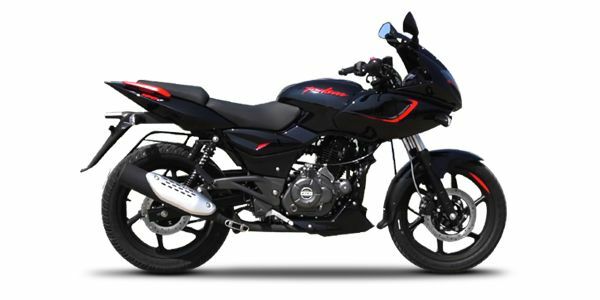 Confused about Bajaj Pulsar 180F?